Melbourne based yoga, barre and Pilates instructor and journalist, Cat Woods, nominates her favourite plant based meals in Melbourne. These are not purely vegan destinations, but offer vegan options. She’s always interested in your recommendations too! Being a vegan in Melbourne is gloriously easy. 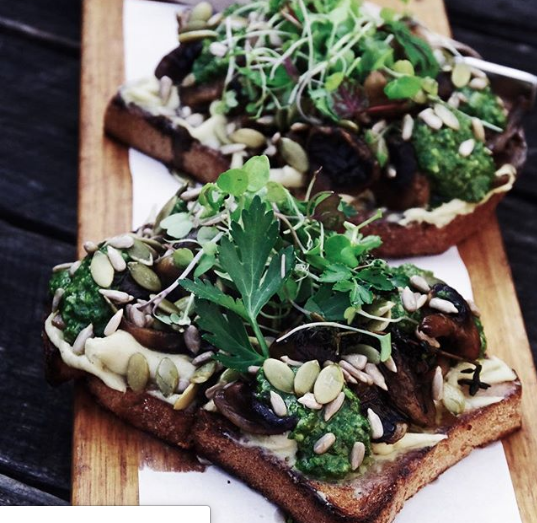 Far from being served a salad with all the fun flavours removed, Melbourne offers a gourmet selection of super nutritious, delicious plant based meals. Whether it’s a 100% vegan or vegetarian venue or whether it’s just got a great variety of meals for both vegans and meat/fish eaters, these are the places I go to and totally recommend. After yoga, Pilates or barre, I’m ravenous for food that nourishes my body and my soul. I can guarantee all of these places are both vegan friendly and will welcome you even when you’re sweaty, toting a yoga mat and decked out in your activewear head to toe. Ever eclectic Brunswick Street is home to this fab choice for lunch or dinner. There’s no waiting around, no fuss and no attitude. Poke bowls originated in Hawaii and on a beautiful, sunny Melbourne day a bowl full of fresh, rainbow salad and fresh avocado is super appetising. I am the most indecisive person when it comes to menus. I just want everything, all at once. The way this menu works is that you pick a base, vegetables, garnish and protein. There’s a bunch of extras you can opt for too. I can’t decide between avocado, mushrooms and tofu so I have all three! I also mix up my base so that I have quinoa and broccoli sometimes or the mixed grain rice and sweet potato mash. So many choices. Whether you’re paleo, keto, vegan or gluten free, you’ll be entirely catered to. They serve your bowl in less than a minute usually and you can grab a takeaway. Perfect for a picnic in the local Edinburgh Gardens. If you can dream up an ideal salad combination, chances are they’ve already thought of it and added it to the menu at Kooks. I have to admit, I usually order my meals delivered since getting to South Melbourne isn’t always convenient when I’m living and working northside. I can heartily admit to being addicted to the cauliflower, flaked almond and tahini salad. It’s not surprising this salad is a staple on the menu. I will break down begging and pleading if they ever remove it. I can also attest that the harissa carrot is divine. This fabulous new Elsternwick venue is relatively new and entirely worth a visit. I can vouch for the falafel and hommus bowl and the breakfast options are divine too. So close to the beach and bay, you can really escape into that feeling of being a beach bum just for the hour or so you’re here. Quinoa, chickpeas and a rainbow of raw veggies round out many of the bowls so you’re ticking all the plant based protein boxes while also feeding your eyeballs. In Brunswick’s Sydney Road, this glorious eco-store and café is a yogi’s dream. A big wall mural and wood tables and stools makes for an inviting place to dine and hang out. There’s an ever-changing rotation of salads based around fresh, seasonal vegetables, seeds, nuts and legumes. There’s also wraps and soups and sweet things, if you’re so inclined. The parking isn’t great, being Sydney Road, so if you can cycle or public transport your way there, that’s ideal. If you’ve got the time and inclination to go for a day trip or a weekend away, I love Store Fifteen in Mornington, Surf Coast Wholefoods in Torquay and RAWR Bar in Apollo Bay. Written by guest author, Cat Woods, a Melbourne based yoga, barre and Pilates instructor and journalist. You’ll find her at http://catwoods.me or @cat13gram.